Livre des faits du bon chevalier Jacques de Lalaing, written c. 1480s, painted c. 1520s. 364 x 262 mm. – 202 leaves, with 18 miniatures, one of which a large, superb portrait, several others of tournaments and chivalric encounters. Flanders, Bruges, written c. 1480s, painted c. 1520s. 364 x 262 mm, 202 leaves, 18 miniatures. f. 36v: Great alarm at the court of the King of France when a tournament is announced. Jacques de Lalaing kneels before Charles, Count of Maine and the Count of St. Pol, and pleads that he may battle in their honour. Simon Bening and workshop, Flanders, Bruges, written c. 1480s, painted c. 1520s. Finely illuminated in a soft, at times transparent palette, this codex is an ode to the Bon Chevalier Jacques de Lalaing and to Burgundian chivalric society. Heroic deeds, beautiful costumes, fine horses, early morning landscape settings and a superb author’s portrait display the brilliance of Burgundian bibliophilia. Our book was handed down for centuries in the same family of descendants and has never been on the market. This splendid manuscript greatly contributes to the legendary memory of the knight who is considered the pinnacle of Burgundian chivalry. 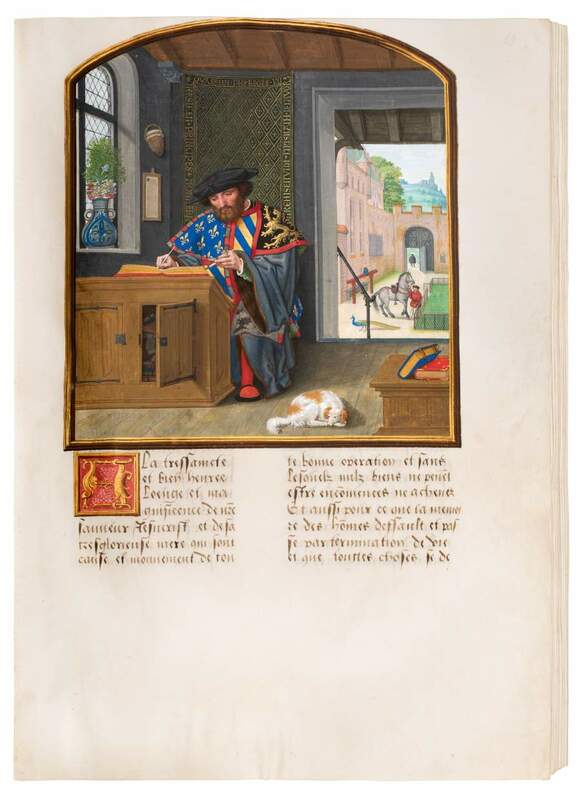 This deluxe manuscript was probably written in the 1480s, left unfinished and illuminated some thirty years later by Simon Bening and his workshop. Most likely this was a commission of Charles I, seigneur de Lalaing (d. 1525), the book's hero’s second cousin. The manuscript's text and images illustrate the main exploits of Jacques de Lalaing (1421-1453), the most exemplary Burgundian knight and one of the best tournament fighters ever. He was the oldest of four sons of Guillaume, lord of Lalaing and Bugnicourt, high bailiff of Hainaut and governor (stadhouder) of Holland (d. 1475). An elegant and chivalrous fighter, Jacques grew into a successful champion of tournaments. Knighted in the service of Duke Philip the Good in 1445, he was elected to the Order of the Golden Fleece six years later. He was killed in the revolt of Ghent at the siege of Poeke castle (1453) – the moment just before the impact of the canon ball that took his life is illustrated in this codex. This codex is, without doubt, the finest Burgundian manuscript (of seven surviving) illuminating Lalaing’s military exploits. The miniatures offer fairly literal interpretations of the key episodes of Lalaing’s career and heroic deeds. The large portrait at the opening is the key to this book. It represents the author, a man in the prime of his life, in his study at work. Herald of the Toison d’Or – identifiable by his splendidly ornamented herald’s tabbard, a costume with the coat of arms of Toison d’Or – is writing at his desk. The texture of his rich costume is incredibly lifelike. The writer’s handsome face is individually modeled and recalls other portraits painted by Simon Bening. The supposed author of the text, Jean Le Fèvre de Saint Rémy was – until his death in June 1468 – Toison d’Or, King of Arms of the Order of the Golden Fleece. Both Toison d’Or and the Bon Chevalier had been close friends.